Perfect for storing long and light loads. Simple, resistant and easy to assemble. Cantilever shelves are easy to configure and adapt to different heights and types of goods. It is specially designed to store long items or items of varying length. The system basically consists of columns or two horizontal beams at the base to provide stability. A series of arms are attached on which the load is placed. All the elements involved fit together easily. 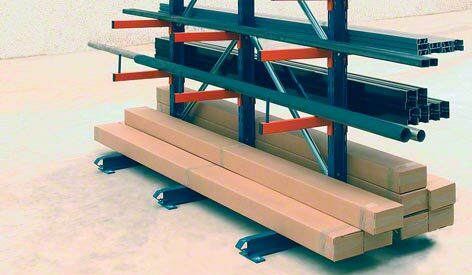 This system has been developed for storing loads manually. It is ideal for the storage of beams, profiles, pipes, timber, etc of light weight. It can be fitted on one side of the structure only, or on both sides.